It’s been said that an Indian kitchen houses the soul of the family. Certainly the delicately balanced aromas and flavours that come out of it nourish the spirit as well as the body. In many households rules concerning the kitchen were strictly adhered to: for example people seeking to be admitted had to be freshly bathed and could not be wearing leather. In other homes only women were allowed in. Many kitchens housed the household’s temple and this linking of the physical and spiritual went further. The cook fed the family’s bodies, treated its wounds and acted as its priest. Even today, in many Indian homes, the kitchen is at the heart. Traditionally one’s prosperity was measured by the size of one’s waistline. Today’s Indians are far more health conscious!Walking into an Indian kitchen you’d recognise plenty that would be familiar but also some equipment that would be slightly less so. A tawa is a thick-based flat iron pan or griddle. It’s especially used for cooking flat breads such as rotis or chappatis. (A large thick-based frying pan can be used in its place. )A handi is a traditional cooking pot, used for slow cooking over heat. It’s wide at the base and thick-bottomed, but with a narrow mouth and a lid. Usually made of copper, brass, earthenware or iron, food can be served directly from it at the table. The kadhai is a wok. No water is used as the food cooks in the juices released by the meat and vegetables (usually tomatoes). A kadhai is usually deeper than a Chinese wok. This is another pan from which food can be served at table. While we might be able to purchase all of these pans, or have something similar, it’s unlikely that most of us will have a tandoori oven. Shaped a bit like a bee-hive, the tandoor is a clay oven that can reach very high temperatures. It’s open at the top, so moisture can escape from the food resulting in a drier finish. Charcoal is used as fuel and it imparts its own peculiar flavour to the dish being cooked. Barbecuing is probably the closest alternative to this method of cooking. 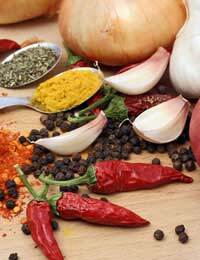 Alongside the cooking equipment, the most important feature of the Indian kitchen must be the spice collection. Most homes will have a masala dabba, a round stainless steel container with seven individual compartments and a teaspoon. In this, the Indian housewife will keep her seven most favoured – and most often used – spices. They might include red chilli powder, turmeric, cumin, coriander, Garam Masala spice mix, green cardamom pods or fenugreek.For those of us who use spices less often, it’s better to buy the whole spice where possible and grind it as required. Even with whole spices, you need to keep a nose on them: if they lose their aroma it’s time to throw them out. Don’t keep spices next to the oven or allow them to get damp. They should be kept in a cool dark place. Use a pestle and mortar to grind the spices or a coffee grinder that is kept solely for that purpose – unless you want curry-flavoured coffee. All the kitchens and equipment we’ve been talking about are to be found in homes in towns or in restaurants; rural India is very different.In 2001 a census estimated that 40% of rural homes don’t have a separate kitchen. As the main fuel used is biomass, such as cow-dung, and there is little ventilation, the resulting smoke with its dangerous gases and chemicals fills the house and is a serious risk to health, especially for women who spend most time in the kitchen.